Following a survey sent to our clients in October, we have reviewed all the feedback received and are pleased to say it was an overwhelming positive response to the proposal of changing our out of hours provider to South Downs Emergency Vets, an exciting new 24 hour purpose built veterinary hospital opening on 28th February 2018 in Storrington. South Downs Emergency Vets has been designed to suit the needs of all pet species. Cats and their owners will have their own waiting area separate to the dog waiting room and if admitted for treatment, cats will have their own first floor accommodation providing a calm, quiet and stress free environment. This falls in line with the service and care we provide at our cat only clinic, focusing on what is best for the patients. South Downs Emergency Vets is independently owned by Matt Gittings who I’ve known for over 25 years since we trained together at the Royal Veterinary College London (rated the best vet school in Europe), giving me peace of mind the best interests of your cat will be at the heart of everything they do. There will also be a dedicated night team of vets and nurses giving you, your cat, and us, continuity of care. We will be able to share access to your cat’s medical records so in an emergency situation you will not have to remember all the details of past and present conditions and treatment. South Downs Emergency Vets will provide emergency cover for us between the hours of 18:30 – 08:00 Monday to Thursday and all weekend from Friday 18:30 to 08:00 Monday, including Bank Holidays. We will continue to hospitalise cats who need treatment at Cat’s Whiskers whenever possible, but I feel reassured that if needed, cats who are transferred to South Downs Emergency Vets will be hospitalised in calm and comfortable surroundings similar to what they are used to at Cat’s Whiskers. This can only aid their recovery further. To ensure you and your cat have access to emergency care should you need it, we pay a monthly fee for out of hours cover when we’re not on site. This means we are in a contract with South Downs Emergency Vets therefore in the case of any emergency our clients are required to go to South Downs Emergency Vets as our current provider will not be able to treat your cat. Having looked at the costs of out of hours care, I know that South Downs Emergency Vets are comparable to our current provider. An evening consultation at South Downs Emergency Vets between 19:00 – 00:00 is £125.50 and between 00:00 – 08:00 is £165. The costs with our current provider are £125 and £175 respectively as of January 2018. We would be happy to give you a sample of other costs should you require this. One of the main concerns raised by you back in October was the distance to South Downs Emergency Vets and I understand this worry. However, after recent feedback and review, I am confident that the move to South Downs Emergency Vets is still in the best interest of your cat/s. Local Worthing taxi company Arrow who are available on 01903 212121 are 24 hours per day, 7 days a week and the approximate cost of a journey from central Worthing to Storrington is £22 one way, with an additional £1 charged for journeys between 00:00 – 05:00. There are many things we can recommended to help improve your cat’s journey in the car including using feliway spray sprayed into your cat’s carrier, providing a comfortable cushion/blanket, and covering the carrier with a towel sprayed with feliway spray. There are other options available so if the longer journey worries you, please contact us at the clinic and we can give you some recommendations. Sadly sometimes when we are closed it is time to say goodbye to your cat and you might not want to face going to the emergency vets. 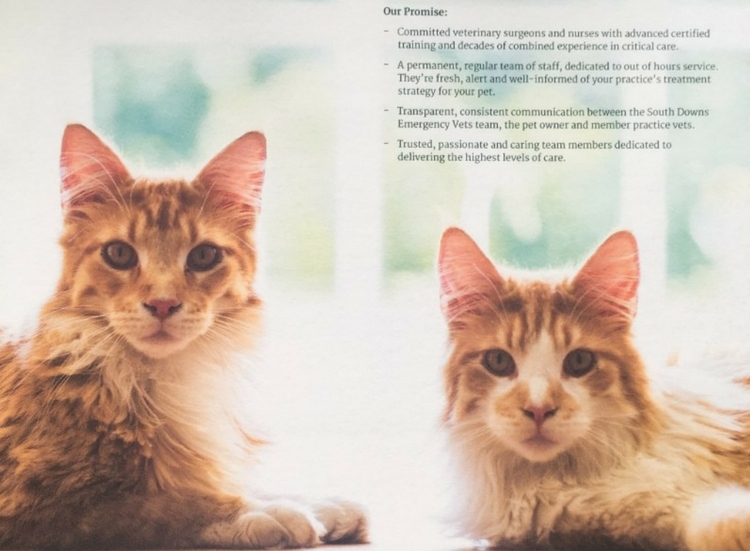 Local company Vets2Home, run by vet Dr Suzan Gregersen, are available 24 hours per day 7 days a week and are able to help you say a peaceful goodbye at home. You can find out more here. I appreciate there is a lot of information to take in and this is a big change, however I haven’t taken this decision lightly. After the initial feedback from you and my passion for improving cat’s vet experiences, I know this is the right decision. South Downs Emergency Vets will be holding an open day on Saturday 24th February 12:00 – 16:00 and many of my Cat’s Whiskers team will be there. It would be great if you are able to come to Storrington on the day to have a look around at the out of hours clinic to see the benefits for yourself. Our out of hours cover will start with South Downs Emergency Vets on Thursday 1st March 2018. Our cover with our current provider remains unaffected until this date so if you do have an emergency outside of our opening hours, please continue to contact them in the usual way until Thursday 1st March 2018. I understand you may have other questions or queries, and if you do, please contact Alison or I at the clinic and we will be more than happy to discuss these with you. You can also find out further information about South Downs Emergency Vets here. Thank you again for your continued support of Cat’s Whiskers Veterinary Clinic. NB – We are also very pleased to announce that from June 2018 we will extending our opening hours at Cat’s Whiskers and will be offering Saturday appointments. More details will be available about our new opening hours closer to the time but in the meantime rest assured that quality care will be provided at weekends by South Downs Emergency Vets.